On January 15, 2014, the first boat of Japanese origin was reported in Twin Harbors Beach State Park in Westport, Washington. While the boat didn't make the evening news, it was quickly collected and examined by biologists of the Washington Department of Fisheries and Wildlife and Oregon State University. Assuming that the boat was Japanese Tsunami Marine Debris (JTMD), this means the boat was in fact drifting at sea for nearly three years before finding its way on shore. This would be a testament to the fact that there certainly is still tsunami debris drifting around the Pacific Ocean (likely within the gyre system), and will continue to make its way to shore in the following years. The boat, which was 22 feet long and covered in gooseneck barnacles, the giant barnacle Megabalanus rosa, ten species of algae, and at least one species of oyster, did have Japanese writing on it, which informed investigators that the boat was called the 'Dai Jyu Hachi Ei-Fuku-Maru', or the "18th Prosperous Fortune". None of the organisms were alive. The boat is in the process of being cross-checked with the Japanese Consulate to determine whether the boat is in fact JTMD. 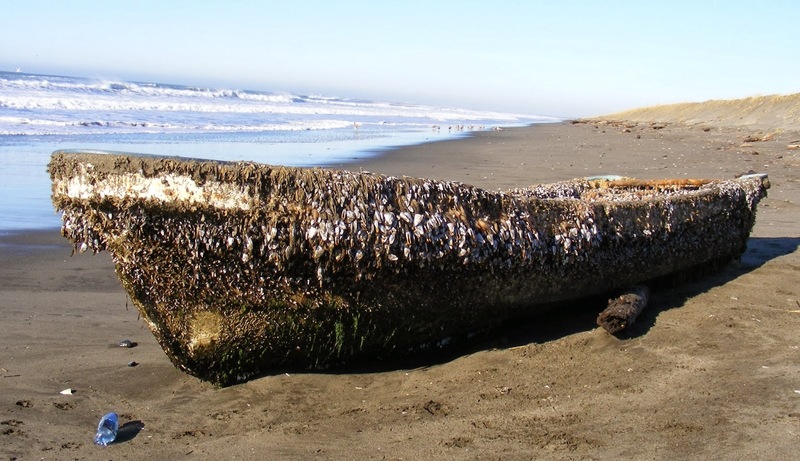 However, the organisms present have led biologists at Oregon State University to believe that the boat is tsunami debris.